Although Mother's Day in the UK is in March, my kids live in Australia, so we celebrate Mother's Day on Australian time. Most mums get flowers or chocolates for Mother's Day, but my kids decided they wanted to get me something that little bit different. They put a lot of thought into it, and surprised me with: my own domain name. So I can now also be found at www.shirley-bee.co.uk. Hopefully for you (and for me) it's situation normal, you don't have to do a thing. You will still get my posts as normal - but you will tell me if I start acting strangely, won't you? I stamped the Julie Nutting Doll in Versafine Onyx Black then sloshed some Evergreen Bough, Tumbled Glass and Walnut Stain Distress inks around, and used Adirondack Metallic Gold acrylic paint, watered down, for the crown and the distress flowers. I'm also entering it into Simon Says Monday Challenge, M - for magazine inspiration. Stamps: Julie Nutting Doll #2, Neat & Tangled Everyday Labels, STAMPlorations Vignette: Grunge Floral Strips. 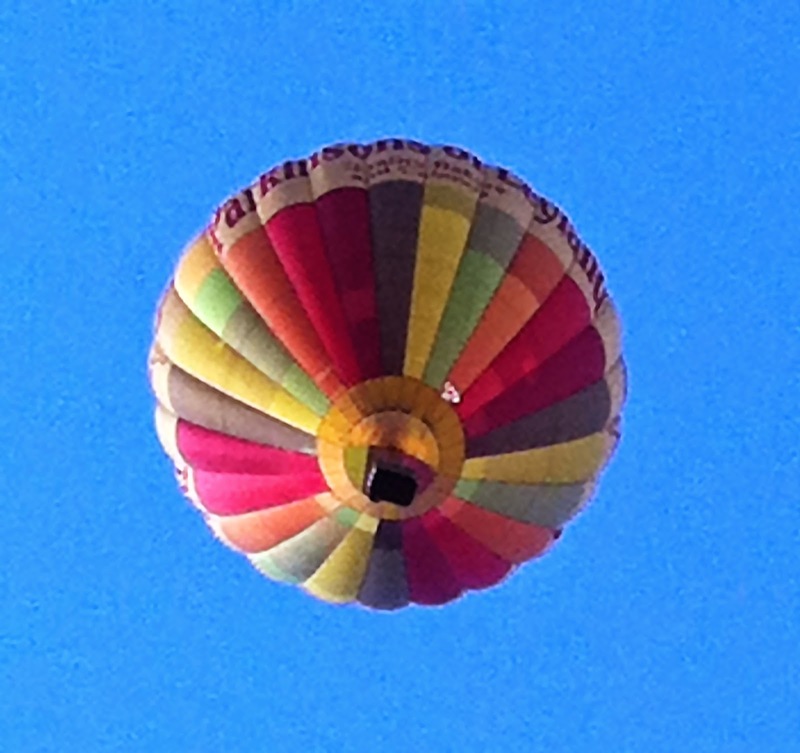 Occasionally we get hot air balloons flying near our house on clear evenings (like I said, occasionally). This evening one flew almost directly overhead, so I took about 30 photos. Look at that blue sky! Good choice of colors and nice image. another amazing card Shirley! 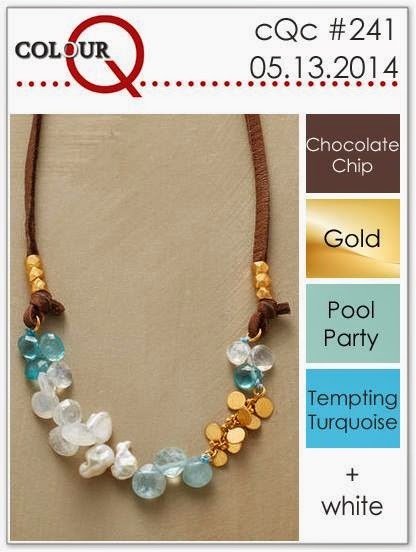 Love the blue & brown combo! What a thoughtful gift from ur kids, it's awesome to have a domain name :) love ur card, the colors and the design is so unique ! 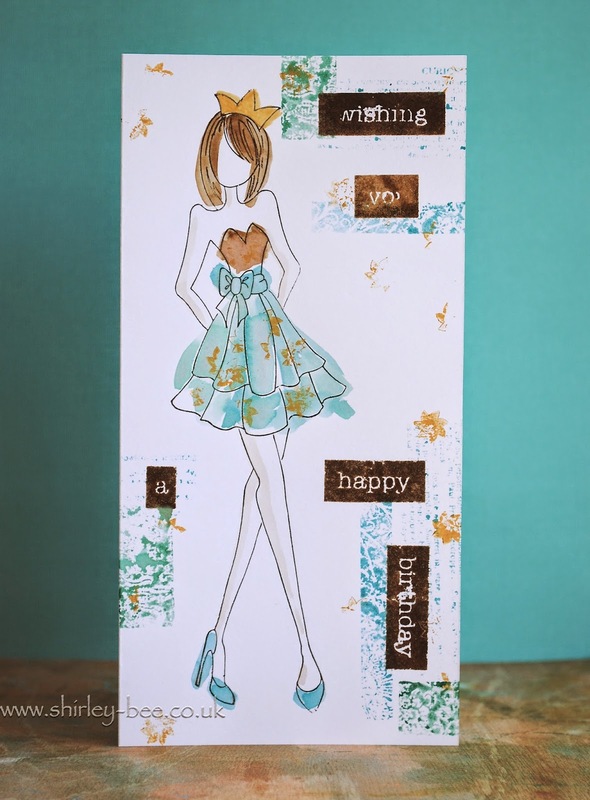 Very creative card, Shirley, I especially love how you water colored the dress, love the image! So glad you played with us at the colourQ. I just love those Prima dolls! Your watercoloring looks great and I like her crown! Thanks so much for joining us at the ColourQ!